The festive season is here but we’ve been thinking about the Christmas Celebrations at The Kinmel Arms for a while now. Paul Anthony has been designing a Christmas menu to suit the season, Heddwen has been focusing on the festive-teas, and we’ve been organising the party nights! What we love best is the small gatherings and the family get togethers. It’s fantastic to be the heart of these events… to see the groups of ladies escaping the hustle of it all over afternoon tea and catching up with old friends; to host the different generations of a family that may only happen once a year; the Christmas reunions where reminiscing sends people back in time; and the romantic couple chilling infront of the open fire on a sneaky get away! So this year, join us for a very special celebration – bring your friends, family or just your loved one. We have our Christmas Fixed menu available and there is always our Winter A La Carte and Afternoon Tea on throughout the season as well. 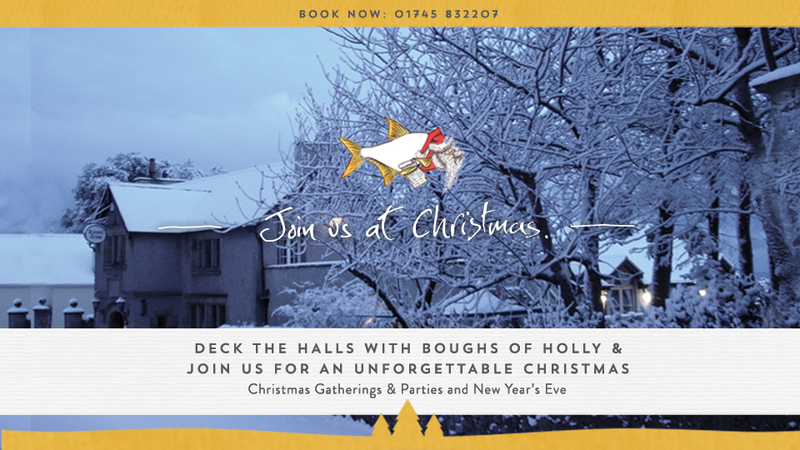 New Year’s Eve – booking quickly so well worth getting in touch asap. Tickets are £70.00 per person (or £90 with wine flight) including a canapé gathering before a 5 course, the best food with live music and dancing until 2am will welcome in the New Year.